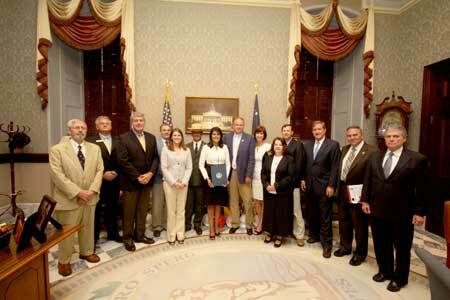 COLUMBIA, S.C. – Outdoor industry leaders gathered in the State House yesterday as Governor Nikki R. Haley officially proclaimed June 2014 as Great Outdoors Month in South Carolina, joining many states across the country in the effort to recognize the outdoors and encourage their enjoyment through recreation and fitness. The proclamation was spurred by the newly formed South Carolina Great Outdoors initiative, a statewide program of the South Carolina National Heritage Corridor that works with local communities and organizations to promote and develop their unique outdoor resources. For more information on South Carolina Great Outdoors visitwww.scgreatoutdoors.org and social media for constant updates. Facts: South Carolina has 47 State Parks, 6 National Parks, 4 National Scenic Byways, and 2 National Heritage Areas. The Outdoor Industry Association reports that in South Carolina alone, outdoor recreation generates 18 billion in consumer spending, 201,000 jobs, 4.7 billion in wages and salaries, and 1 billion in state and local tax revenue.